Are you wanting to adopt a new cat but worried about how your resident cat will feel? I recently went through this when I brought a new cat home myself and wanted to share the 5 steps I took in order to introduce the new cat into my apartment home. First thing you should have set up before you bring the new cat home is a "safe room" that they can stay in for 1-2 weeks. This room should be an area that the resident cat does not typically spend much time in, such as a bathroom or 2nd bedroom. The room will have toys, litter box, bed and food. 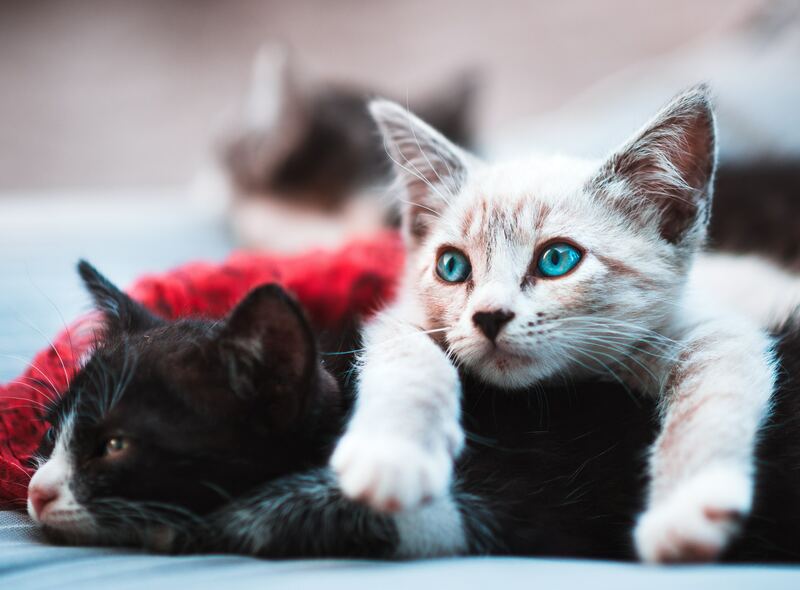 This process is beneficial for both feline's as it allows the new cat to get accustomed to your apartment and its scents, and allows the resident cat to not be threatened by someone new in their territory. The new cat will also lose the scent of where it came from and will begin to smell like your apartment which will be less threatening to your resident cat. Once the cats are nice and comfy in their spaces it's time to slowly introduce them by way of scent. Cats gather an incredible amount of information about the world around them by smell! One of the best ways to begin this introduction is by setting up a "blind dinner date" for them. You will start by placing the cat's bowls of food on opposite sides of the door at equal length. This helps them associate the smell of their new companion with their tasty food - creating a positive connection! Slowly bring the bowls closer and closer together over time. This all still without seeing each other! If the passive introduction goes smoothly, now it's time to introduce them to one another but we will keep them at a distance away from one another. Set up a baby gate where the door once was closed and continue the food bowl trick we did prior. Letting them see the other cat and get used to their presence before putting them in the same room will make both cats feel safer. Now that the cats have become some-what used to the other's presence, you can begin to introduce supervised play time. Start with short spans of time and if either cat displays aggression (hissing, ears drawn back, growling, or swatting) stop the play time and take a step back in the process. We never want them to fight it out or feel threatened in their home. After all, we want them to get along! Giving them treats for good behavior is always recommended as a way to positively reinforce their actions. Making your apartment more fun for your cat will also increase the probability of play time! This process can be long or short depending on the personalities of the feline's involved. Cats, just like humans, have personalities, and as we know not all personalities mix well. You want to ensure they both feel safe, but it may take some time for them to warm up to each other; this is what happened with my cats! Now that you know how to properly introduce a new cat into your apartment it's time to find your new best friend! Here are the best ways to find your perfect furry roommate.